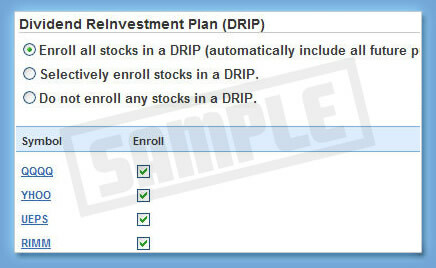 Use SogoTrade's DRIP center to enroll a stock and ETFs. Everytime the stock and ETFs you enrolled pays a dividend, SogoTrade will use the payment to purchase more stocks and ETFs. Enroll or Cancel at anytime for Free. View the DRIP video tutorial to learn more.